This specimen (IVPP 8275), the holotype, was collected from the Lower Lufeng Formation of Yunnan, China. 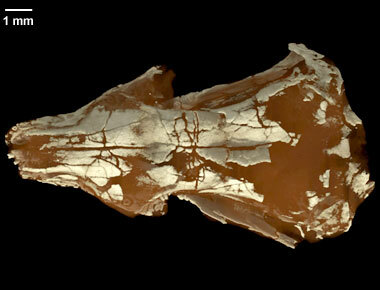 The specimen was made available to The University of Texas High-Resolution X-ray CT Facility for scanning by Dr. Zhe-Xi Luo of the Carnegie Museum of Natural History. Funding for image processing was provided by a National Science Foundation Digital Libraries Initiative grant to Dr. Timothy Rowe of The University of Texas at Austin. The specimen was scanned by Richard Ketcham on 6 February 2003 along the coronal axis for a total of 735 1024x1024 pixel slices. Each slice is 0.0191 mm thick, with an interslice spacing of 0.0191 mm and a field of reconstruction of 9 mm. Alroy, J. 1998. Cope's Rule and the dynamics of body mass evolution in North American fossil mammals. Science 280:731-734. Bloch, J. I., Rose, K. D. and P. D. Gingerich. 1998. New species of Batodonoides (Lipotyphla, Geolabididae) from the early Eocene of Wyoming: Smallest known mammal? Journal of Mammalogy 79:804-827. Cifelli, R. L., Wible, J. R. and F. A. Jenkins. 1998. Triconodont mammals from the Cloverly Formation (Lower Cretaceous), Montana. Journal of Vertebrate Paleontology 18:237-241. Clemens, W. A. 1980. Rhaeto-Liassic mammals from Switzerland and West Germany. Zitteliana 5:51–92. Foote, M. 1997. The evolution of morphological diversity. Annual Review of Ecology and Systematics 28:129-152. Fraser, N. C., Walkden, G. M., and V. Stewart. 1985. The first pre-Rhaetic therian mammal. Nature 314:161-163. Herring, S. W. 1993. Formation of the vertebrate face: epigenetic and functional influences. American Zoologist 33:472-483. Hu, Y.-M., Wang, Y.-Q., Luo, Z.-X., and C.-K. Li. 1997. A new symmetrodont mammal from China and its implications for mammalian evolution. Nature 390:137-142. Jenkins, F. A., Crompton, A. W. and W. R. Downs. 1983. Mesozoic mammals from Arizona -- new evidence on mammalian evolution. Science 222:1233-1235. Ji, Q., Luo, Z.-X. and S.-A. Ji. 1999. A Chinese triconodont mammal and mosaic evolution of the mammalian skeleton. Nature 398:326-330. Kielan-Jaworowska, Z. 1996. Characters of multituberculates neglected in phylogenetic analyses of early mammals. Lethaia 29:249-266. Kielan-Jaworowska, Z. and J. H. Hurum. 1997. Djadochtatheria: a new suborder of multituberculate mammals. Acta Palaeontologica Polonica 42:201-242. Luo, Z.-X., Crompton, A. W. and S. G. Lucas. 1995. Evolutionary origins of the mammalian promontorium and cochlea. Journal of Vertebrate Paleontology 15:113-121. Luo, Z.-X., Crompton, A. W. and A.-L. Sun. 2001. A new mammaliaform from the Early Jurassic and evolution of mammalian characteristics. Science 292:1535-1540. Musser, A. M. and M. Archer. 1998. New information about the skull and dentary of the Miocene platypus Obdurodon dicksoni, and a discussion of ornithorhynchid relationships. Philosophical Transactions of the Royal Society Series B 353:1063-1079. Parrington, F. R. 1978. Further account of Triassic mammals. Philosophical Transactions of the Royal Society of London Series B 282:177-204. Rowe, T. B. 1988. Definition, diagnosis, and origin of Mammalia. Journal of Vertebrate Paleontology 8:241-264. Rowe, T. B. 1996. Coevolution of the mammalian middle ear and neocortex. Science 273:651-654. Sigogneau-Russell, D., and R. Hahn. 1995. Reassessment of the late Triassic symmetrodont mammal Woutersia. Acta Palaeontologica Polonica 40:245–260. Smith, K. K. 1997. Comparative patterns of craniofacial development in eutherian and metatherian mammals. Evolution 51:1663-1678. Van Valkenburgh, B. 1995. Tracking ecology over geological time: evolution within guilds of vertebrates. Trends in Ecology and Evolution 10:71-76.
von Maier, W. 1989. Morphological studies on the auditory bulla of marsupials. Zeitschrift fur Zoologische Systematik und Evolutionsforschung 27:149-168. Click on the thumbnail to the left for a pitch animation (1.8 mb) of the isolated Hadrocodium cranial endocast. Click on the thumbnail to the left for a roll animation (1.8 mb) of the isolated Hadrocodium cranial endocast. To cite this page: Dr. Timothy Rowe, Dr. Thomas Macrini, Dr. Zhe-Xi Luo, 2006, "Hadrocodium wui" (On-line), Digital Morphology. Accessed April 19, 2019 at http://digimorph.org/specimens/Hadrocodium_wui/.